There are many Vaishnava kshetrams in India, which are referred to in the Puranas (Purana sthalams), or Divya Desams where Azhwars have sung in praise of the Lord (108 Divya Desams). Thirukkoodalur is situated at about 12 km from Tiruvaiyaru on the Tiruvaiyaru-Kumbakonam road in Tamil Nadu. It is one of the 108 Divys Desams. This is also called as Aaduthurai Perumal Koil or Sangama Kshetram. Thirumangai Azhwar has sung in praise of the Lord here in 10 pasurams. This is a ‘Purana’ as well as a ‘Prarthana kshetram’. This temple is where the Devas have congregated to worship Lord Vishnu and prayed to him to save the Earth from demon Hiranyakshan. Hence the reason for Lord Vishnu’s incarnation or Varaha Avatar. The place is called ‘Thirukkoodalur’ as the Devas came together to pray to Lord Vishnu. (‘Koodal’ means coming together). The main deity here is called as Jagatrakshaka Perumal or Vaiyam Kaatha Perumal, which means the Lord who has saved the earth. Lengend says that a saint by name Nandakamuni had worshipped the Lord here. His daughter Ushay served the Lord by offering flowers (puspa kainkaryam). A Chola king fell in love with Ushay, married her and took her to his kingdom.. But Ushay and the King got separated due to the evil designs of the clergy and the ministers in the kingdom. The Lord at Thirukkoodalur was responsible for bringing the estranged wife and husband together. This is mentioned as another reason for the place being called ‘Thirukkoodalur’. Lord Jagatrakshaka Perumal has given darshan to Devas, Nandakamuni, Ambareesan, Thirumangai Azhwar, Brahma, Ganga, Yamuna and Saraswathi at this place. The Lord here is a swayambu. Lord Jagatrakshakan had helped Ambareesan to fulfil his Ekadesi vratham at this holy place. When the Cauvery prayed to the Lord to wash away the sins given by all the others by taking bath in the river, the Lord said she should flow near His shrine at Thirukkoodalur. Thus the sins of the Cauvery were washed away. But due to the floods and fury of the Cauvery, the temple was washed away in course of time. The Lord fell into the safe custody of the fishermen. Later, in the 18th century, Rani Mangammal rebuilt the temple in its current form, as she sought to fulfil the dream she had. The present temple structure built by Rani Mangammal fell into a bad condition and hence renovation and restoration activities at the temple were undertaken in 2003 at an estimated cost of Rs 65 lakh. The mahasamprokshanam was held on June 11, 2003. The sthala vriksham here is ‘palaa” (jackfruit tree). When an attempt was made to cut a part of the tree for carrying out the renovation work, a natural formation of a big conch was found on the trunk of the tree. Pilgrims throng the temple now to witness this conch formation. Thirumangai Azhwar has sung 10 pasurams in praise of the Lord here. Prayers to beget happiness in the family and blissful life between partners in marriage are answered by the Lord and Goddess here. It is customary to perform pujas and homams on one’s wedding days here. The locals pray to the Lord here by offering ghee lamps made out of broken coconuts and raw rice to get jobs. Thirukkoodalur can be reached from Kumbakonam (about 25 km). Any bus going to Thiruvaiyaru from Kumbakonam stops at Aaduthurai Perumal Koil. You may have to ask for getting down at Ullikkadai Perumal Koil stop and the buses stop just in front of the temple. Alternatively, you can reach the temple from Thiruvaiyaru, near Thanjavur. There are no boarding or lodging facilities in Thirukkoodalur and one has to reach the place from either Thanjavur or Kumbakonam. 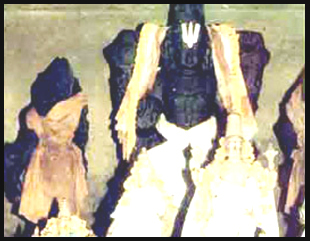 Utsavar - Vaiyankaatha Perumal or Jagathrakshagan with a sengol in his hand. Theertham - Chakra Theertham, Cauvery river. Access to the temple On the way from Thirukkandiyoor towards Kumbokonam at a distance of 7 miles. The Moolavar of this temple is Sri Vayyam Kaatha perumal. Also named as Jeghathratshakan, Uyyavanthaar. Moolavar in Nindra Thirukkolam facing East direction. Prathyaksham for Nanthaga Maharishi. It is located on Kumbakonam - Thiruvaiyaru Road. The temple on the roadside just before the bus stop.